The record is made up of 1 b&w photographic print held within a blue card window mount. It was created in c 1907. It was written in Urdu and English. The original is part of the British Library: Visual Arts. This image depicts the Bab ‘Anbari, one of eight gates in the outer wall of the city of Medina al-Munawarah, each of which is listed in the surrounding prose on the right-hand side of the mount. In the distance, through the arch of the gate, the minarets of the Masjid al-Nabawi (Prophet’s Mosque) are visible. The writer of the prose asserts that the majority of pilgrims on the hadj would have entered the city through this gate, located in the southwest of the city. 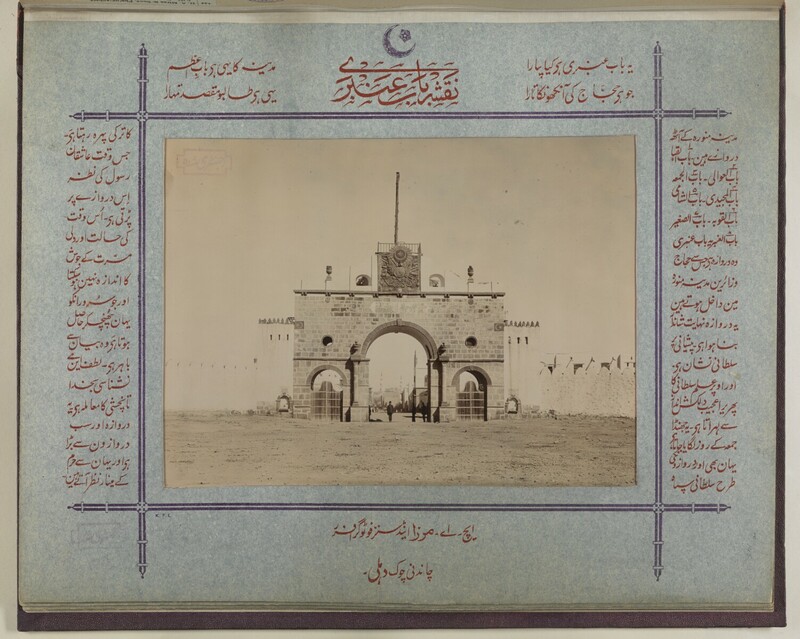 The significant role played by Ottoman troops in overseeing the hadj during this period is indicated by the reference in the surrounding prose, the prominent position of Ottoman insignia above the gate, including the toughra of Sultan Abdulhamid II and the inclusion of an Ottoman soldier, posed in the open archway. ‘145 H. A. Mirza and Sons, Photographers. Delhi. (Octr. 15, 1907.) 14 x 18º. Mount is mildly bowed, with very light staining along all edges. Very light staining is also visible on the paper verso The back of a paper sheet or leaf. backing, which is under-laid by cotton strips. The print shows signs of extensive toning and is distorted gently throughout. Blemishes throughout the sky area result from a combination of those introduced during the printing process and post-printing surface residues.